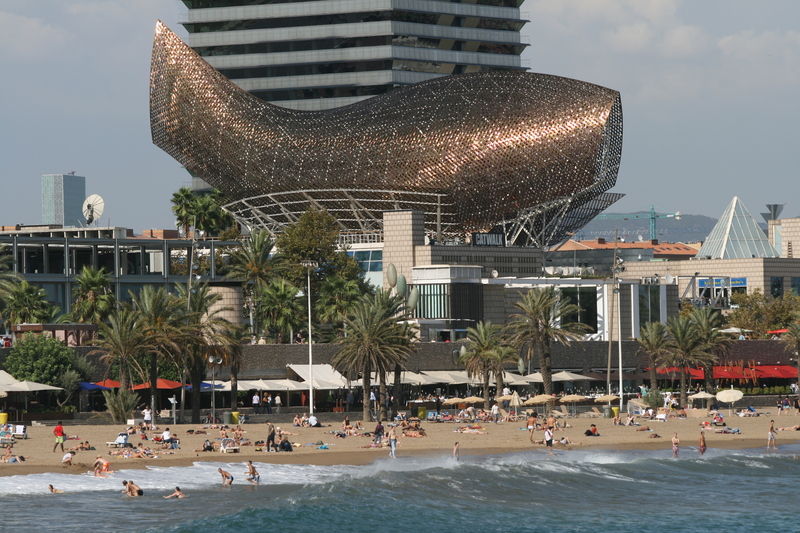 If you walk along the beach of Barcelona, you will notice an unusual sculpture at the water’s edge. This is one of the symbols for the post-Olympic Barcelona. It is said that if you look at this fish, named El Peix in the right light it looks like its bobbing along the water of Barcelona´s beaches. We hope you enjoy our hotel for family in Barcelona. The sea front of Barcelona changed in preparation for the Olympics in 1992. There was a new marina build and twin towers were built to house the athletes of the Olympics. Just for this even Frank Gehry created a golden fish sculpture and placed it at the food of the Art Hotel. This large sculpture is 56 meters long and 35 meters high (184 feet long and 115 feet high) and was made from intertwining golden stainless steel strips supported by a metal structure. This was done to make it look like the scales of a fish in the sun. The sculpture also contains stone and glass. The colour of the fish changes depending on the sunlight and is bright gold during the day and shifts to a darker bronze in the evening. This fish has also become a well-known symbol for Port Olympic and the surrounding areas. It is said that it is the centrepiece of the port and perfectly symbolises it. This is due to its modern and beautiful golden outline in the shape of a fish to represent the Mediterranean Sea and busy artisan life that is the port. Whether you purposely or accidently see this golden shinny fish its modern design represents the Olympics that have now come and gone. This fish also represents the Port Olympic area and its growing modern culture and artisan hub. Enjoy your stay in our familial aparthotel in Sarrià!